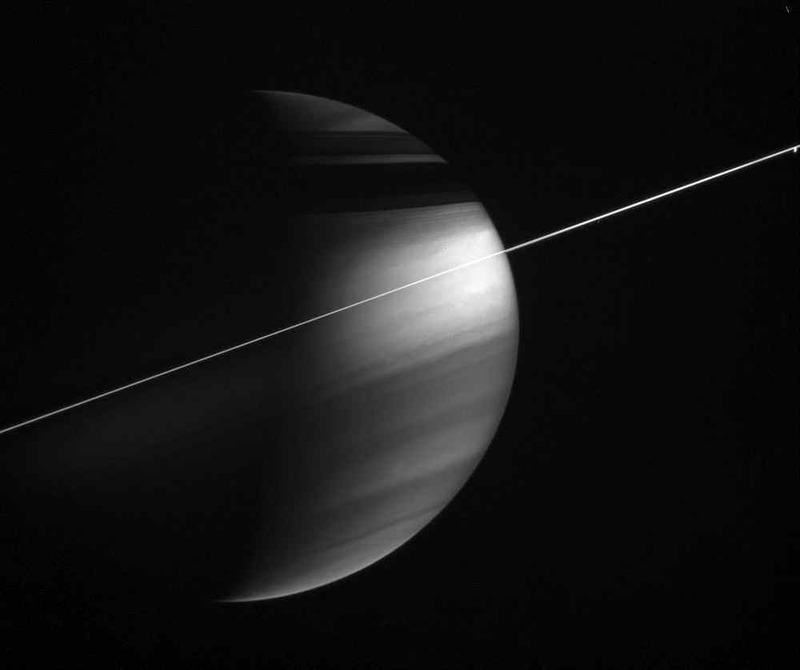 In this magnificent view, delicate haze layers high in the atmosphere encircle the oblate figure of Saturn. A special combination of spectral filters used for this image makes the high haze become visible. A methane-sensitive filter (centered at 889 nanometers) makes high altitude features stand out, while a polarizing filter makes small haze particles appear bright. Methane in the atmosphere absorbs light with wavelengths around 889 nanometers as it travels deeper into the gas planet, thus bright areas in this image must represent reflective material at higher altitudes. Small particles or individual molecules scatter light quite effectively to a polarization of 90 degrees, which this polarizing filter is sensitive to. Thus, high altitude haze layers appear bright in this view. The small blob of light at far right is Dione (1,126 kilometers, or 700 miles across). 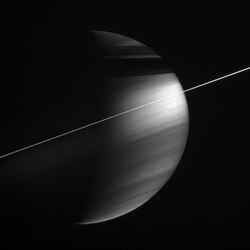 The image was taken with the Cassini spacecraft wide-angle camera on Dec. 5, 2005, at a distance of approximately 2.9 million kilometers (1.8 million miles) from Saturn and at a Sun-Saturn-spacecraft, or phase, angle of 100 degrees. The image scale is 169 kilometers (105 miles) per pixel.